Preheat oven to 200°C. Roughly chop half the spinach then add to a large bowl (reserve the remainder for step 6). De-seed capsicum and cut into 1cm dice. Pat dry chicken with paper towel then cut into 2 cm cubed pieces. Warm tortillas as per packet instructions. Place chicken and spice mix into a bowl and toss to thoroughly coat. In a medium pan over medium heat, add oil. When oil is shimmering, add the diced chicken and capsicum and season with salt and pepper. Cook, until browned, about 6 - 8 minutes. Taste and add more salt and pepper, only as needed. Rinse and drain red kidney beans. Transfer chicken to a chopping board then cut in half or shred with 2 forks. Add chicken and capsicum to the large bowl with chopped spinach. Add half the salsa, and the red kidney beans then stir to combine. Lay tortillas flat on a clean dry surface. Divide filling evenly among tortillas. Fold sides around tightly to create cylinders. Transfer seam-side down to a medium baking dish, arranging in a single layer. Spoon remaining salsa in a line across the top of the enchiladas. Sprinkle over the cheese. 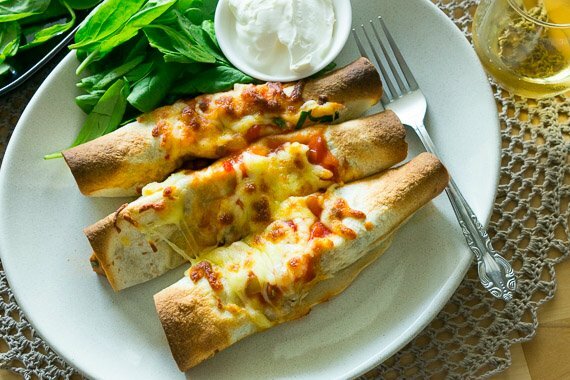 Bake until cheese is melted and enchiladas are warmed through, 8 - 10 minutes. Divide enchiladas evenly between plates. Season to taste. Serve with remaining spinach and sour cream on the side. Enjoy!